Home > Law Books > Statutes > Indiana Civil Procedure Laws, 2019 ed. Indiana Civil Procedure Laws, 2019 ed. Indiana Civil Procedure Laws compiles the primary sources of laws affecting Indiana Civil Procedure in one convenient pamphlet designed for use in the office or courtroom. Recompiled and republished annually, it remains the most comprehensive and timely publication of its kind on the market. 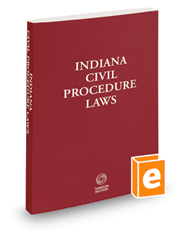 This work contains the complete text of Indiana Code Title 34, Civil Procedure, and statutes relating to Indiana civil procedure, including relevant articles from Indiana Code Title 33, Courts and Court Officers.